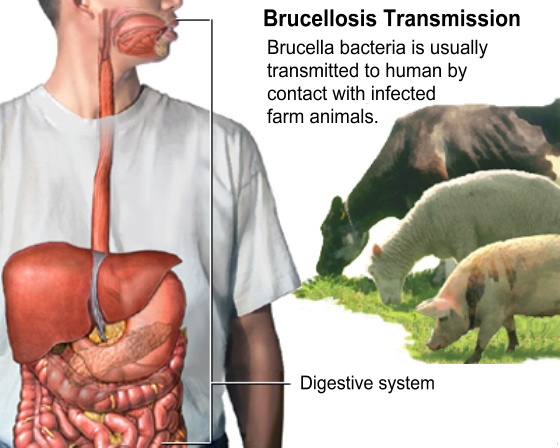 Brucellosis is an infectious disease caused by bacteria. It is called a zoonotic disease, a disease that can be transmitted from animals to humans. People can get the disease when they are in contact with infected animals or animal products contaminated with the bacteria. Animals that are most commonly infected include sheep, cattle, goats, pigs, and dogs, among others. • Eating undercooked meat or consuming unpasteurized/raw dairy products. The most common way to be infected is by eating or drinking unpasteurized/raw dairy products. When sheep, goats, cows, or camels are infected, their milk becomes contaminated with the bacteria. If the milk from infected animals is not pasteurized, the infection will be transmitted to people who consume the milk and/or cheese products. 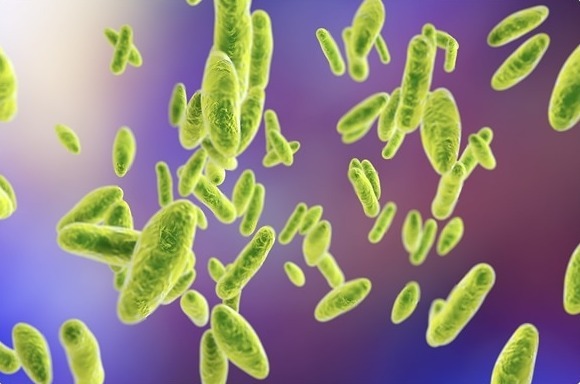 Breathing in the bacteria that causes brucellosis may also lead to infection. This risk is generally greater for people in laboratories that work with the bacteria. In addition, slaughterhouse and meat-packing employees have also been known to be exposed to the bacteria and ultimately become infected. Bacteria can also enter wounds in the skin/mucous membranes through contact with infected animals. • inhaling the bacteria while dressing their game. Commonly infected animals include: bison, elk, caribou, moose and wild hogs (feral swine). Person-to-person spread of brucellosis is extremely rare. Infected mothers who are breast-feeding may transmit the infection to their infants. Sexual transmission has been rarely reported. While uncommon, transmission may also occur via tissue transplantation or blood transfusions. 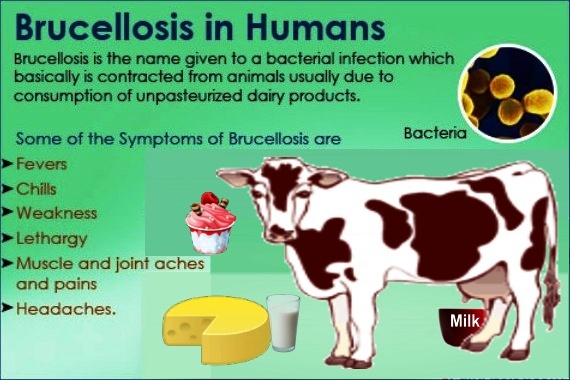 Brucellosis can cause of range of signs and symptoms, some of which may present for prolonged periods of time. Some signs and symptoms may persist for longer periods of time. Others may never go away or re-occur. Before treatment begins, a diagnosis of brucellosis infection must be made by a doctor. Tests will be performed to look for bacteria in samples of blood, bone marrow, or other body fluids. In addition, a blood test can be performed to detect antibodies against the bacteria. Once a diagnosis is made, a doctor can prescribe antibiotics. Depending on the timing of treatment and severity of illness, recovery may take a few weeks to several months. Death from brucellosis is rare, occurring in no more than 2% of all cases.